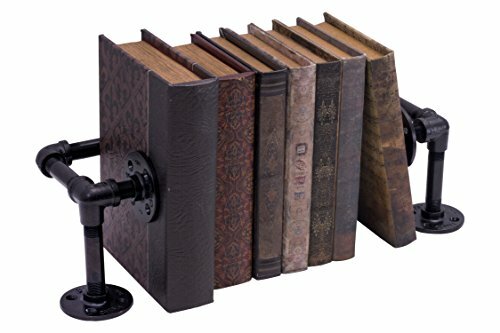 Use this rustic, industrial-themed Pipe Décor stand to display your books and DVDs in style. This chic black stand will add an eye-catching appeal to your room while keeping your books and DVDs neatly organized. Quality materials and chic style combine to create this unique piece. The stand is made with durable iron pipes and electroplated with a black finish to resist rusting. Super-easy step-by-step illustrated instructions make assembly simple. Pipe Décor was founded by LDR Industries, a leading supplier of high quality kitchen, bath, plumbing and related products in the home improvement sector. Realizing that retail stores were quickly selling out of basic pieces, like flanges, the idea of Pipe Décor was born: an idea to help hobbyists find the products they need for their do-it-yourself, Pinterest inspired projects. With the rise of Pinterest and do-it-yourself projects, Pipe Décor is a way to showcase your creativity all while creating functional and visually aesthetic pieces that last. At Pipe Décor we're about the community; we're a channel where people can gauge new ideas, hear other people's stories, and learn about what items are available to create. Here at Pipe Décor we're modernizing pipes and using traditional materials in new innovative ways. We can't wait for you to join us on our journey! If you have any questions about this product by PIPE DÉCOR, contact us by completing and submitting the form below. If you are looking for a specif part number, please include it with your message.